Scenic college posters are popular choices for dorm room decorations. They are stunningly gorgeous and when you don't have a scenic view outside of your college dorm room, they make a fantastic substitute. Plus your college dorm room walls are going to be pretty plain and beg for some dorm wall art. With scenic dorm posters in your dorm essentials, you get a win-win. You get a fantastic scenic view, and you also get some amazing college wall decor that makes your college dorm room feel like home. You don't have to be from an area that your scenic college poster is of in order to enjoy it! Although if you are from the area, it is a great way to make your college dorm room feel even more like home because it will be a photo from your home area! 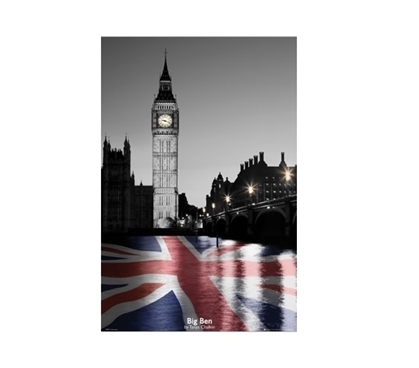 Our Tanya Chalkin Big Ben College Poster is a stunning piece of dorm wall art that will make your college dorm room decor complete. Our Tanya Chalkin Big Ben Dorm Room Poster features a grayscale photo of Big Ben with the Union Jack flag on the water in front of. The effect of the colored flag in front of the grayscale photo in the backdrop creates an effect that's truly stunning. This dorm essentials item will make your other dorm room decorations pop with color against the black and white effect of this gorgeous college dorm poster. Make your college supplies complete and your dorm room decor stunning with our Big Ben college dorm poster!